Postal workers are being urged not to drop their elastic bands to help keep the streets of south London clean. Lewisham Council estimates up to 5,000 elastic bands are dropped in the borough by postal workers every month. Steve Bullock, Mayor of Lewisham, said valuable time was being wasted picking them up and urged Royal Mail to take a "collective responsibility". Royal Mail said although the bands were bio-degradable they would urge staff to take extra care in future. Mr Bullock said the council wrote to Royal Mail about the matter more than a year ago but nothing had changed. "It adds up to unnecessary work for us... if everyone takes a collective responsibility we can live in a much cleaner environment," he said. A Royal Mail spokeswoman said staff were aware they should not drop rubber bands, however, they were "focused on delivering 83m items a day and can't always keep track of every band." 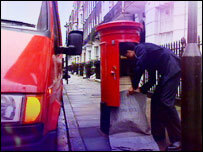 Royal Mail said it used an estimated 342m bands a year and the vast majority were reused.